Does your skin care regimen change with the seasons? Does it change according to your specific skin care needs? While I tend to stick with my tried-and-true skin care favorites, I sometimes switch up products or try new products according to my needs. Today, I'm sharing my current regimen and rotation of products with you guys. Though the product line-up may seem pretty simple, it does a great job of keeping my skin in check. I have combination skin, which causes my t-zone to be more oily in the warmer months and fairly dry in the winter months. My biggest skin concerns are keeping my skin radiant and firm and correcting my acne-scarring/hyper-pigmentation . Through this regimen, I've been able to take care of these issues quite well. 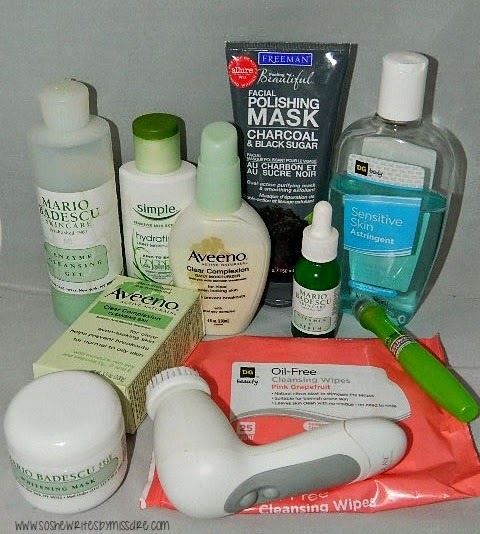 Read further to check out the full details of my current skin care regimen. Mario Badescu Enzyme Cleansing Gel- This is my holy grail cleansing product. It's gentle, revives dull skin, and smells like pure freshness. Simple Skincare Hydrating Moisturizer- This has been one of my favorite moisturizers ever. It doesn't contain any harsh dyes or perfumes, and provides just enough moisture for my oily skin. Unfortunately, after I stocked up on this moisturizer, it was discontinued. Aveeno Clear Complexion Cleansing Bar- The cleansing bar is my part-time cleanser. It is made for normal and oily skin types and does a great job of preventing breakouts and reducing hyperpigmentation. Without proper moisturizing afterwards, it can be a bit drying though. Aveeno Clear Complexion Daily Moisturizer- This has become my holy grail moisturizer. Just like the cleansing bar above, it prevents breakouts, reduces dark spots, and makes my skin so smooth. It also provides just enough moisture without making me oily. Mario Badescu Whitening Mask- This mask is my little gem. It works behind the scenes in helping reduce my dark spots. Olay Professional Pro-X Brush- The Pro-X brush, used in conjunction with my cleansing bar or enzyme gel, gives me a deep cleansing for a fraction of the price of a Clarisonic. This brush is very budget-friendly! Freeman Facial Polishing Mask | Charcoal & Black Sugar- I adore this mask. It's also a part of my holy grail. It absorbs my excess oil with the quickness, exfoliates like no other, and leaves my skin baby smooth. Mario Badescu Vitamin C Serum- This is one of my favorite skin care products of all time. I keep going back to it. If you haven't read my review on this product, please stop what you're doing and check it out now. DG Beauty Oil Free Cleansing Wipes | Pink Grapefruit- I use these on days I wear makeup. They're not drying and they have a light citrus scent that I love. DG Beauty Sensitive Skin Astringent- I don't use a toner everyday. Only during the summer during days my skin is extremely oily and on days I wear a full face of makeup and need to add that extra deep cleansing after my normal cleanse. It isn't overly drying and gets the job done. Garnier Skin Renew Anti-Puff Eye Roller- I've been using this product since forever. The cooling sensation of the roller alone is enough to calm the morning puffiness down to nothing. I love it! Day and Night: I cleanse with Mario Badescu Enzyme Cleansing Gel using the Olay Professional Pro-X brush to cleanse deeply. Then I moisturize with Simple Skincare Hydrating Moisturizer. When my skin tends to misbehave (breakouts, PMS, or emerging dark spots), I switch these products with Aveeno Clear Complexion Cleansing Bar and Aveeno Clear Complexion Daily Moisturizer, respectively. After cleansing and moisturizing, I apply my Garnier Skin Renew Anti-Puff Eye Roller around my under eye area to complete my basic skin care. Bi-weekly: On Tuesdays and Thursdays, along with daily cleansing and moisturizing, I add an additional step to my routine by applying Mario Badescu Whitening Mask to my dark spots only. On Monday and Wednesday nights, I apply the Mario Badescu Vitamin C Serum to my face, following my basic routine. Friday or Saturday Night: I exfoliate my skin with Freeman Beauty Facial Polishing Mask in Charcoal and Black Sugar. 1. Drinking more water- As someone who has been plagued with acne-prone skin and scarring since adolescence, I learned to eliminate sodas from my diet back in my teens. Though I've always been keen on drinking water, I don't always drink as much as I should. My goal is to drink at least a 1/2 gallon of water daily. 2. Eating "Pretty"- It's amazing the difference your diet can make in your skin. Whatever you're feeding yourself internally definitely shows on the outside. Just adding superfoods like yogurt, salmon, spinach and green tea into your diet has improved my skin's clarity and radiance over time. For more great foods for your skin, click here. 3. Changing my pillow case at least twice weekly- Planting your face on not-so clean linen nightly is a no-no. This is self-explanatory. 4. Cleaning my satin hair scarf twice weekly- Yes, I religiously wear my scarf to bed. I have to keep my moisturized tresses in place! But if one doesn't routinely keep her scarves clean, the breakouts are soon to come. To find out the easy, economical way I keep my scarves clean, click here for Youtuber jmarie's instructional video. 5. Keeping my cellphone clean or away from my face, if possible- We all know that cell phones can carry several germs from all of the handling. The same goes for our hands. That's why I keep my hand sanitizer on deck and carry electronic cleansing wipes (like the ones you use to clean your computer and tablet screens) to keep my phone clean. 6. Wearing less makeup- Contrary to popular belief, I do not wear makeup everyday. As a WAHM, it really does me no good to be all made up with no where to go EVERY.SINGLE.DAY. But when I am out and about during the week, I've been wearing little to no makeup. Not wearing a full face all the time definitely helps my pores breathe. 7. Pampering myself and eliminating stress- It has been said several times that stress is not good for the skin. Now I'm not sure of the scientific facts linking stress to breakouts, but I do know when I'm stressed, it shows on my face. In my case, it may have lots to do with the fact that stress causes me to indulge in poor habits, such as eating junk food. But when I pamper myself, by getting manicures and pedicures, enjoying a night on the town, or simply having quiet time alone in my home space with my music and candles, my overall health reaps the benefits. Skin included. WHAT DO YOU DO TO KEEP YOUR SKIN IN CHECK?